I've always considered myself a developer and a LOWER(DBA). I may have recovered perhaps one database and that was just a sandbox, nothing production worthy. I've built out instances for development and testing and I've installed the software a few hundred times, at least. 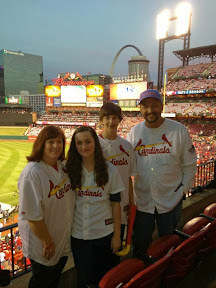 I've done DBA-like duties, but I just don't think of myself that way. I'm a power developer maybe? Whatevs. I'm sure it would be nearly impossible to come up with One True Definition of The DBA ™. So I won't. I read Cary for years and always assumed he was a DBA. I mean, have you read his papers? 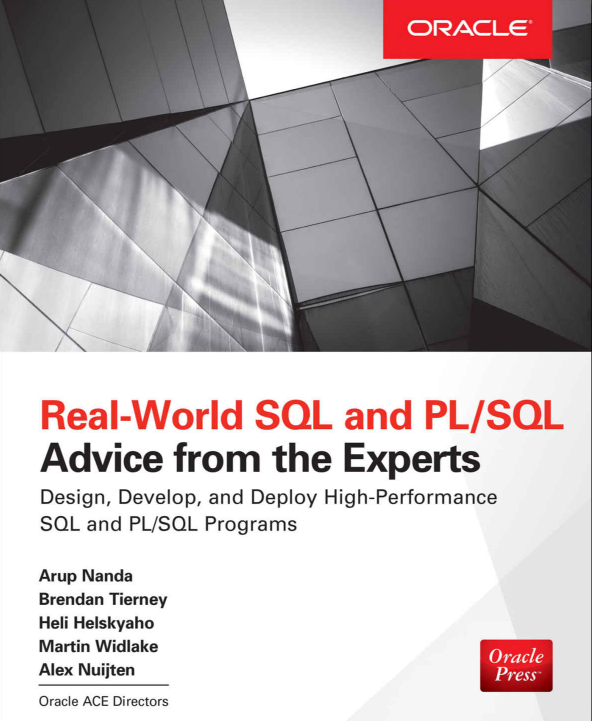 Have you read Optimizing Oracle Performance? Performance? That's what DBAs do (or so I used to think)! It was only after working with him at #kscope11 on the Building Better Software track that I learned otherwise. Calculated items in OBIEE Pivot tables can be very useful in certain reporting circumstances, either for ease of development, or to meet specific report requirements. 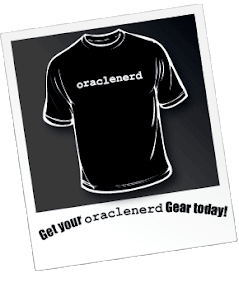 While calculated items in OBIEE are easy, and flexible, they do have one important drawback: they take on the data and display formatting of the fact column they are calculated against. Not very pretty at all. Use HTML formatting tricks to “hide” trigger text in the results, then conditionally format off those triggers. While inventive, as the comments note, this solution falls flat if the report is ever printed, as the PDF engine will pick up and display all of the hidden characters. Convert the pivot table to a regular table with some complex column formulas. Very time consuming and cumbersome, would also not solve the requirement of showing the dimension values noted as noted in Footnote1. 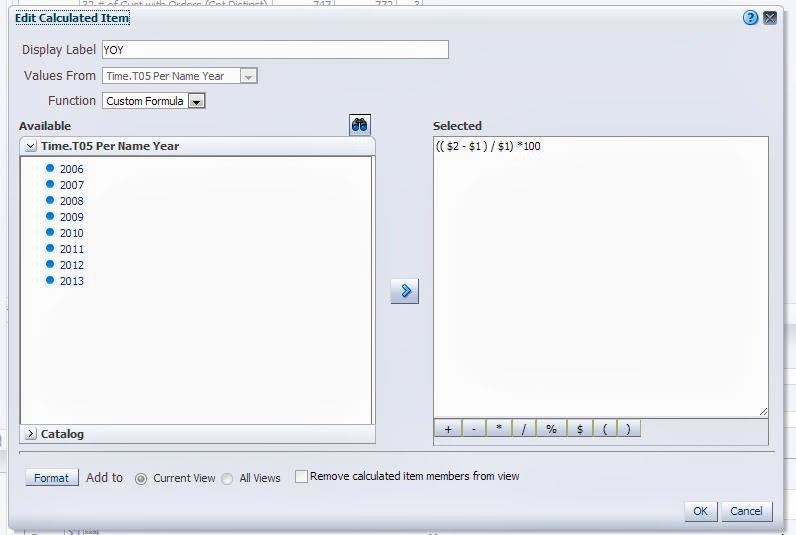 Convert the calculated result to text and manually add your formatting characters. I don’t think this actually works since the calculated fields won’t accept logical SQL functions, and this would be very cumbersome. 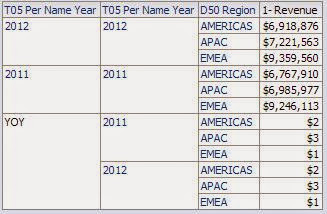 Add a column that is a COUNT DISTINCT on the dimension that you are calculating across ( in the displayed example, “Time T05 Per Name Year”. This column will serve as your “trigger” to apply your conditional formatting. For each of your facts, apply a conditional format that is triggered when the above column value is zero. In the formatting, apply whatever visual and data formats you desire. 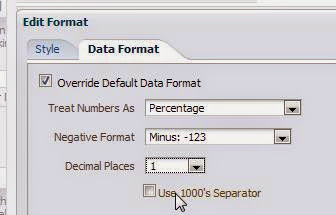 In this example we will format the data as a percent, with one decimal place. Figure 7 - Correct formatting of calculated item. * Note that this would also allow you to apply visual formatting if you wanted to distinguish this row/column as a total. The reason for all this is that the calculated item “borrows” EACH of the dimension values it operates against. Hence, no matter how inventive your filter is, as long as you are trying to somehow separate the calculated member away from the members it is operating on, you will never succeed. This member “borrowing” is apparent if you add the dimension it operates against to the query a 2nd time, and look at the table view. But since the “member value” given to the calculated item does not actually exist in the dimension, if you try to perform a count distinct against it, you will always get zero. There is your difference; there is your “trigger.” The rest is basic formatting. 1: You might suggest that this requirement is better served using column(s) with time series calculations, and you might be right. However, more often than not the user will want to SEE the time periods being compared ( 2012 vs 2011, or 08/07/2012 vs 08/07/2011). When using facts with time series calculations you will only be able to show “this year” vs “last year” since the column heading of the time series calculated fact will always be static. In these cases you will need to use the base fact and a time dimension, along with the solution provided here. 2: All screen shots, and examples used in this post are performed in Sample App V305. An XML of the final correctly formatted report can be downloaded here.